Vicente Fox Quesada was born in Mexico City on July 2, 1942. 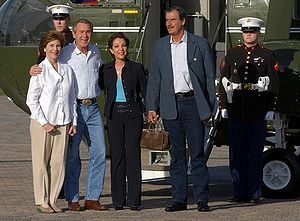 He was the President of Mexico from 2000 to 2006. Fox was the first president not elected from the Institutional Revolutionary Party (PRI) since 1929. During Fox's presidency the peso's devaluation to the United States Dollar was unsubstantial, annual inflation was consistently under 10% and Central Bank reserves were significant. He is also credited with increasing respect for freedom of speech as well as access to Mexican public information. Fox's administration pushed negotiations for a "comprehensive immigration reform" that addressed the problem of illegal immigration to the United States. During Fox's term, Mexico did not support the U.S.-lead invasion of Iraq. He was succeeded by Felipe Calderon who participated as Secretary of Energy in his cabinet. On December 1, 2006, in the middle of a political crisis, Fox left the presidency of Mexico. After his presidency, Fox became a vocal critic of U.S. candidate and President Donald Trump due to his opposition to Trump's America First agenda. Fox is a globalist and opposes Brexit, criticizing democracy even as he praised the authoritarian regime of China. ↑ Kassam, Raheem (April 6, 2018). Ex Mex Prez Vicente Fox Lets ‘Globalist Cat Out of Bag’ in Farage Debate: Lauds Authoritarian China, Slams Democracy. Breitbart News. Retrieved April 6, 2018. This page was last modified on 26 September 2018, at 16:17.